The fresh paint on dozens of newly refurbished historic buildings in Downtown Cairo not only gives a new lease of life to the city’s 19th-century centre, known as Khedival Cairo, but also allows the buildings themselves to gaze out in defiance of their eclectic surroundings in an assertion of the great power of dreams. A stroll down the carefully planned boulevards of Khedival Cairo introduces the careful observer to an incredibly rich variety of architectural styles that conjure up stories of how a young Egyptian aristocrat, or “pasha”, growing up in 19th-century Egypt, was introduced to a plethora of creative ideas during his education in France. He dreamed of implementing them in his home city of Cairo, hoping to turn swampland plagued by floods (Cairo at the time) into a “Paris on the Nile”. That ambitious young pasha was the khedive Ismail who ascended the throne and became the ruler of Egypt in 1863. Downtown Cairo, the triangle situated between today’s Tahrir Square, Bab Al-Hadid and Abdine Square, soon became the object of Ismail’s passion. He wanted to turn it into “part of Europe”, something to amaze the prestigious guests who came from all over the world to attend the momentous inauguration of the Suez Canal in 1869. Giving birth to this new and cosmopolitan city not only demanded a lavish spending spree on Ismail’s part, but also attracted enthusiastic architects from all over the world, particularly France and Italy. 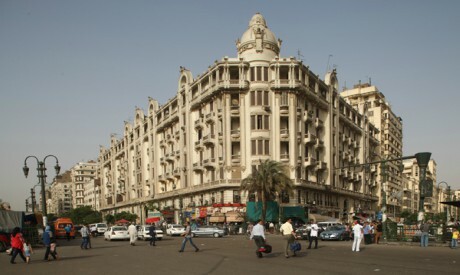 These were given full rein to exercise their expertise and imagination in the urbanisation of the area, resulting in an astonishing mix of art deco, art nouveau, baroque and, a little later, neo-Islamic styles — an urban masterpiece attracting droves of affluent tenants and businesses from among Egypt’s cosmopolitan elite. However, later as more modern suburban areas emerged many of the affluent tenants of Downtown Cairo decided to move out, with some deciding to turn their former flats into offices or business premises. “By the 1940s, Ismailia [the original name of the Downtown district] had become a business district, with only a minority of families, usually the less affluent, electing to stay on,” wrote Al-Ahram Weekly writer and chronicler of Egypt’s modern history Fayza Hassan. The 1952 Revolution, and the subsequent exodus of Egypt’s foreign communities after 1956, dealt a blow to Cairo’s belle époque city-centre. “For almost half a century, it went into sleep mode, its activity diminished, its boutiques no longer attracting the elite, and its apartments taken over by professionals,” Hassan wrote. Many beautiful old edifices were turned into schools or government offices, and others suffered from serious negligence. It was during late president Anwar Al-Sadat’s Open Door economic policy in the 1970s that the area further plunged into a state of eclecticism and decay. However, good ideas die hard, and today, more than 150 years later, there are new dreams of giving a facelift to the khedive Ismail’s now-aging and somewhat wrinkled brainchild. Many have dreamed of restoring Downtown Cairo since at least the 1990s, but many such revival attempts have not exceeded a coat of paint. Who said cosmetic surgery would be easy, especially as the subject here are the 500 or so historic buildings making up the Downtown area and covering an area of around two million square metres? GAINING MOMENTUM: This time there seems to be real political will to revive Downtown Cairo, and the passionate dreamers no longer stand alone, with state and non-state actors, the private sector and civil society all playing roles in the development drive. A Cairo Heritage Development Committee (CHDC) was formed a year ago by a presidential decree of late 2016 with a mandate to examine strategies “for a better future for Downtown and Historic Cairo” and to draw up a comprehensive master plan that will balance the area’s historic preservation with its economic growth potential. A mega-project to regenerate Khedival Cairo was first envisioned in 2009, but it did not get into gear until 2014 when stability was regained following the political and economic upheaval of the 25 January Revolution in 2011. “Today, the CHDC is breathing tremendous life into the Downtown area,” insists CHDC Media Spokesman Tarek Atia. Atia has a Downtown office from where he runs Mantiqti, a Downtown-Zamalek community magazine that advocates for the regeneration of the whole of central Cairo. He points to Mantiqti’s two-page coverage of the planned Downtown development pinned onto the wall beside his desk, as if demonstrating the profound changes that are taking place in the neighbourhood. “There’s a lot going on out there, refurbishing historic buildings, turning streets into pedestrian areas, regulating traffic, new signage and lighting, paving sidewalks, renovating cinemas, refurbishing squares and flyovers, and the Corniche,” Atia says. Thanks to the CHDC, he adds, the “political will for change is strong”, and efforts “are being integrated in perhaps an unprecedented way to correct previous faults”. The man at the helm of the CHDC is former prime minister Ibrahim Mehleb, who had already shown deep interest in the Downtown area when he was in office, rebuilding dilapidated pavements, regulating traffic, removing street vendors, and re-zoning coffee-shops that had trespassed onto roadways. CHDC members include the Cairo governor, the head of the Urban Planning Organisation, the head of the General Organisation for Urban Harmony, the CEO of the New Administrative Capital, where many government offices currently located in Downtown buildings will be relocated, Mahmoud Abdallah, international expert in asset management, and Hisham Ezz Al-Arab, chairman of the CIB Bank and head of the Banking Association, who is responsible for financing plans. Under the development plans, the Downtown area is envisioned as a cultural and shopping hub, a tourist destination, and a venue for local people where “an abundance of offices and homes” stand “side by side with attractions and entertainment venues like hotels, restaurants, bars and museums,” according to Atia. But the great potential of the neighbourhood also needs “a new kind of sophisticated outlook and investment strategy” if it is to be fully realised, he notes. NEW LEASE OF LIFE: Following the 25 January Revolution, “the streets of Egypt witnessed an unprecedented occupation by all types of citizens. Particularly persistent was the occupation of street-vendors in the streets of the Downtown Cairo area,” said a 2016 Cairo University study entitled “The Urban Regeneration of Public Space: Al-Alfi Street, Downtown Cairo”. Public space then was claimed in its entirety as a public right, and sometimes street-vendors could be seen using traffic booths as fitting rooms, and sprawling cafés almost blocked passageways and bridges. The government had to step into the fray, seeking “an approach to upgrade sites in Downtown Cairo and to set new conditions for the use of public space”, the study said. The current three-phase CHDC project aims to restore a total of 500 historic buildings, in addition to refurbishing main squares, thoroughfares and passageways at a total cost of LE450 million. The first and second phases of the project started with the removal of street-vendors, the better regulation of road traffic, repaving pavements and restoring 100 edifices and a number of squares at the cost of LE100 million. Al-Alfi and Al-Borsa streets were pedestrianised and refurbished as pilot projects for a future more pedestrian-friendly neighborhood centre. The third phase of the project, well underway, aims at restoring about 300 buildings and reclaiming six squares at the cost of LE350 million. The Cairo governorate can only afford to pay for a fraction of the regeneration process — unofficial estimates put it at 10 per cent — and the government has thus been inviting state and non-state stakeholders, civil society and, just as importantly, local residents and shop-owners to take part. “The government cannot do everything on its own,” Riham Arram, general manager of the Cairo governorate’s General Administration for Cairo Heritage Preservation, said. Thanks to the generous contribution of the National Bank of Egypt, for instance, motorists will soon be able to relish a drive back into Egypt’s modern history as they take two of Cairo’s historic bridges, the Qasr Al-Nile Bridge and its sister Al-Galaa flyover. The Misr Insurance Holding Company has refurbished some of the buildings it owns in the area, as have private companies and other banks. “The national banks already channel two per cent of their revenues to community services, and now that there is a clear plan to preserve the Downtown area the banks are ready to throw their hats into the ring,” explained Haidi Shalabi, from the National Organisation for Urban Harmony. Walking through Downtown Cairo, one cannot help but be awestruck by the efforts that are now being made to refurbish many ancient edifices. The refurbishment of the Khedival Buildings on Emadeddin Street, for example, once home to the khedive Ismail’s entourage and servants from Abdine Palace, and of the nearby Halawa apartment building exude an aura of grandeur. A taxi-ride allowed the present writer to feast her eyes on unique historic buildings that have already been restored in Talaat Harb, Tahrir and Abdine squares, as well as newly cleaned up streets like Emadeddin, Qasr Al-Nil, Al-Falaki and Bab Al-Louq. Shalabi said that the preservation is no longer restricted to façades. Experts have been carefully chosen to restore decorative ornamental schemes as well as the interiors of presently dilapidated buildings. Just as importantly, they have been asked to investigate the adaptive reuse of the historic edifices. The refurbished 1903 Cosmopolitan Hotel, for instance, will now be reused as a three-star hotel, while the current restoration of Downtown’s landmark ice-cream shop Groppi’s is bound to attract nostalgic visitors from all over the world. “Historic city-centres all over the world have two and three-star hotels to attract tourists, something we have been largely missing in Downtown Cairo,” Shalabi noted. BALANCING INTERESTS: The private sector had been showing interest in the neighbourhood since 2008, when the government adopted its vision for Cairo 2050. Al-Ismailia for Real Estate Investment was the first real-estate investment company to be concerned solely with Downtown Cairo, established in 2008 by a group of prominent Egyptian and Saudi Arabian investors and managed by BPE Partners (formerly Beltone Private Equity) with a capital of LE380 million. 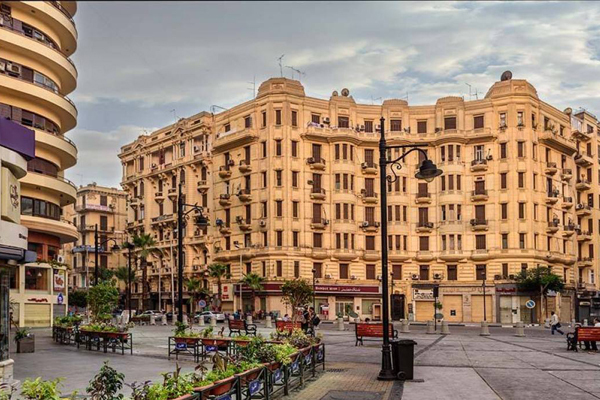 Al-Ismailia has so far refurbished 22 signature buildings that it owns in central Cairo. However, although the contribution of the private sector has been a major driving force in the development drive, it has also been a source of anxiety. A 2015 American University of Cairo thesis by Hajer Awatta entitled “Whose Downtown is it Anyway?” examines how the contributions of state and non-state stakeholders could affect the public interest. “Downtown Cairo is experiencing an urban transformation guided in part by neo-liberal globalisation, capitalist investment interests, and the emergence of an independent culture-arts scene,” Awatta wrote. That kind of gentrification, “often exceeds the relocation of residences and can impact income-generation when low-income residents have to relocate to affordable residences over 30km away with public transportation systems that are often unreliable and expensive,” she added. Lounging on a bench in the recently refurbished Al-Alfi Street one lazy Saturday afternoon, researcher Bayoumi Abu Gabal expressed similar worries. For him, Downtown Cairo is a haven and a source of inspiration, and it is one of few affordable venues for limited-income families. An equally sceptical Awatta speculated that the regeneration of historic city-centres could “create conflicts between local forces, as each have their own goals and desired vision… Theoretically, the state is the protector of the ‘public interest’; however, it is often difficult to define what that interest is,” she wrote. Yet, this is what CHDC members say the committee has been doing over the past year, bringing together all state and non-state stakeholders, as well as community members, in a debate to envision an inclusive plan that balances the interests of all stakeholders and citizens. “A city-centre for all” is the vision that almost all those interviewed by the Weekly saw as the target of the plans. “Those fears are totally unfounded,” Arram said, adding that the public interest was being taken into ample consideration. “When we relocated the street-vendors, we provided an alternative market for them in Torgoman, for example. When we closed streets to traffic, we built underground garages, and so on,” she said. Outside Arram’s office is another case in point. The historical aura of the refurbished Abdine Square is nicely tinged with the cheerful flavour of families picnicking in the public garden in the middle of the square. “As you see, urban regeneration never means stopping people from enjoying the place,” Arram said with a smile of satisfaction. But exactly how private businesses will invest in the area without affecting its demographic character remains an issue of concern. Atia is not worried, however. “All city-centres worldwide should boast a variety of low-priced and expensive shops and cafés for everyone to enjoy,” he said. “When we started we had a clear vision for the district, ‘A Downtown for All’ where everyone would have the chance to explore one of the most magnificent neighbourhoods in Cairo,” maintained Moushira Adel, marketing director of Al-Ismailia for Real Estate. The company had conducted extensive research on the urban fabric of the neighbourhood so that “preserving it will also mean reserving Downtown’s identity,” Adel said. Al-Ismailia also envisions re-attracting the “positive traffic of young people and entrepreneurs to live, work, shop and socialise” in the area, while also providing a wide range of free and variedly priced activities and events to revive its cultural buzz, according to Adel. “Over the past two years, we have managed to renovate some of our buildings, and the restoration has included infrastructure, façade face-lifting, and the reuse of the buildings to suit contemporary needs,” Adel told the Weekly. “The Radio Cinema, the building at 22 Abdel-Khalek Tharwat Street, and the Kodak building are all good examples,” she said. “New concepts are being designed for some of our iconic properties, such as the Old French consulate, which will be a co-working space, the Café Riche building, which will be serviced apartments, the Kodak building, which will be a food and beverage hub, and Champollion Street, which will be launched in a month’s time,” Adel added. “It is good to mention here that the rehabilitation is happening in full accordance with green building standards,” she said. BEATING CHALLENGES: However, it may remain a challenge to apply the same regeneration dynamics adopted by private businesses to many government-owned buildings or privately-owned residential blocks. Many of these may have infrastructure problems, and many beautiful edifices have units that are already rented out, or have been turned into warehouses or workshops. The government cannot always afford to compensate small businesses, and older tenants may not want to leave, even if they cannot afford to contribute to the restoration process. How the government plans to deal with such challenges remains an open question. Will there be attempts to compensate small businesses or old tenants, forcing them to relocate? Shalabi said the CHDC is studying ways of relocating warehouses or workshops that do not conform to the historic buildings, also in attempt to bring back the neighbourhood’s demographic balance. “Many Downtown inhabitants had to leave when these inappropriate businesses emerged in the first place, and now we are simply seeking ways to evict illegal practices and attract the inhabitants back. It is usually the inhabitants who are the ones that are keenest on preservation,” Shalabi explained. Arram said that new legislation was urgently needed that would impose harsher penalties on violators, if the current preservation is to be sustained. “Many warehouses, for instance, returned shortly after having been evicted in the absence of penalties in the current law,” Arram lamented. In the same vein, when the governorate replaces ugly billboards with smaller ones that conform to the style of the area, the owners of small businesses repost them in the belief that they will attract more clients. The law only fines them LE10 for the violation. “It’s a cultural problem, and it will take time to raise awareness, as we have been doing through cultural events,” Arram said. Greater community participation and awareness is an important lesson that the government seems to have learnt from its past experience of regeneration in the districts of Al-Alfi and Al-Borsa. Al-Alfi was regenerated in 1997, but the renovations only included turning it into a pedestrian street, paving roads, and painting façade. The Al-Borsa regeneration in 1999 made better headway, as it included the participation of the private sector and banks, and people were more satisfied with the outcome. However, both districts deteriorated over the years, partly due to the absence of sustainability plans, and particularly in the aftermath of the 25 January Revolution “when public space was invaded by all kinds of people, and almost entirely lost to the appropriation of street-vendors,” according to the Cairo University study. “The regeneration project in Al-Alfi Street was initiated in order to try to control a situation of chaotic trespassing… and regain the power of the state,” the study added. Both areas have now been rehabilitated with the participation of the local community. Al-Alfi is now a buzzing recreational centre, with the zoning of cafés taking place under the scrutiny of security cameras. “We have created a Tenants Association and fund for the Street and have hired a company in charge of rubbish-collection and security,” Shalabi added. Almost all those interviewed by the Weekly on Al-Alfi Street expressed their satisfaction that it had dramatically improved, with buildings nicely painted and the street becoming much more friendly to pedestrians. Shop-owners also expressed their happiness, except for the fact that the government needed to prevent street elements from intruding on the privacy of visitors, they said. The Al-Borsa and Al-Alfi areas are envisioned as pilot projects, but there is definitely no one-size solution that will fit all areas. Other areas may have problems of long-neglected buildings whose owners are seeking to demolish them and build towers on the rubble in order to make profits, risking the areas’ architectural identity, for example. “More and more people only care about money,” lamented the elderly owner of one old-fashioned men’s wear shop on Emadeddin Street. “Many historic buildings have already been left to deteriorate or been demolished. Refurbishing buildings will not restore the lost elegance of the people either. You can’t turn the clock back,” he said. However, there are still those trying to work against the clock to save what is left of Egypt’s architectural legacy. The General Organisation for Urban Harmony has stepped into the fray, registering 750 buildings in Khedival Cairo as part of the 6,000 buildings it has registered nationwide. “These buildings are now preserved by strict preservation guidelines backed by legal force,” Shalabi said. Yet, as Atia points out, “extracting the gold” from the old may need “a more sophisticated outlook” that will also retain the identity and demographic character of the neighbourhood. After all, “what we need is a Cairo on the Nile, not a version of Paris,” a passionate Atia says, as we stroll through the streets replete with layers of history that give Downtown its unique character.